Birmingham is Alabama's most populous municipality. Wikimedia Commons has media related to Cities in Alabama. ^ For municipalities located in more than one county, the primary county (according to U.S. Census) is listed first. ^ a b c d e f g h "GCT-PH1 – Population, Housing Units, Area, and Density: 2010 – State — Place and (in selected states) County Subdivision". 2010 United States Census. United States Census Bureau. Retrieved June 17, 2015. ^ "Alabama: 2010 Population and Housing Unit Counts 2010 Census of Population and Housing" (PDF). 2010 United States Census. United States Census Bureau. September 2012. p. 19. Retrieved June 17, 2016. 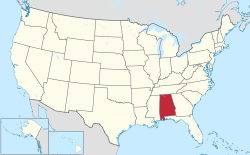 ^ a b c "Code of Alabama - Title 11: Counties and Municipal Corporations - Section 11-40-6 - Municipal corporations classified as cities or towns; holding of election after change in government of municipality". Archived from the original on October 6, 2015. Retrieved December 8, 2015. ^ "U.S. Decennial Census". Census.gov. Retrieved May 27, 2013. ^ a b c d e f g h i j "2000-2010 Entity Changes" (txt). 2010 United States Census. United States Census Bureau. Retrieved June 17, 2016. ^ "Cusseta Reinstated As City; Council, Mayor Appointed". Worldnow and 12 WSFA. Archived from the original on 2015-10-05. Retrieved 2015-08-31. ^ Accardi, Marian (February 23, 2018). "Huntsville votes to annex into Morgan". www.decaturdaily.com. Decatur Daily. Retrieved February 25, 2018. ^ "Resolution No. 2006=02 Authorizing Employment of Municipal Council" (PDF). Town of Magnolia Springs. 2006-12-11. Archived from the original (PDF) on 2015-10-06. Retrieved 2015-08-31. ^ "Welcome to the Town of Perdido Beach". Town of Perdido Beach. Retrieved 2015-08-31. ^ "About Valley Grande". City of Valley Grande. 2015. Retrieved 2015-08-31. ^ "Boundary Changes". Geographic Change Notes: Alabama. Population Division, United States Census Bureau. 2006-05-19. Archived from the original on 2006-02-06. Retrieved 2008-08-24.